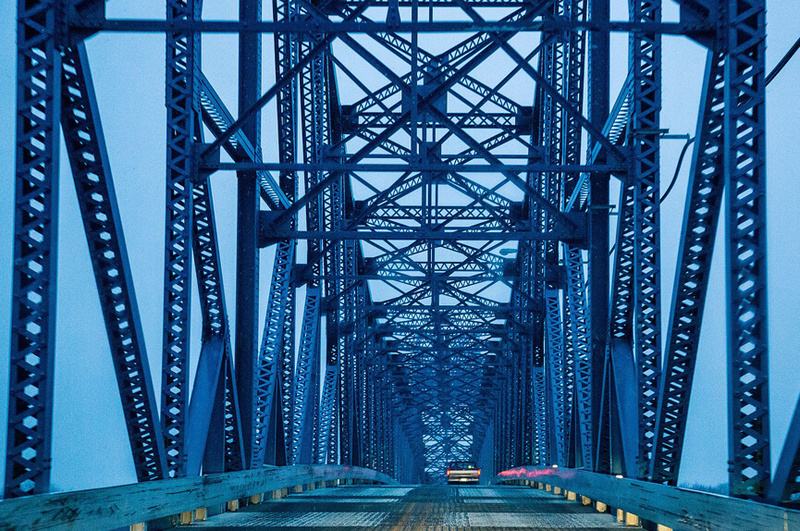 The Savanna-Sabula Bridge was a truss bridge connecting the city of Savanna, Illinois, with the island city of Sabula, Iowa. Finished in 1932, the bridge was replaced in 2018 with the adjacently built Dale Gardner Veterans Memorial Bridge. As is typical with the construction of bridges replacing existing bridges, the Dale Gardner Veterans Memorial Bridge was constructed while the Savanna-Sabula Bridge was still in use in order to avoid any disruption of traffic flow. One the new bridge was finished, only then was demolition of the old bridge allowed to commence. The primary hazard that exists anytime a bridge is built to replace an existing one is to maintain structural integrity of the operating bridge. When building an adjacent bridge, drilling into the river bed can cause foundational erosion under the operating bridge which could result in catastrophic structural failure. Additionally, placement of structures during bridge construction must be very precise. Individual pieces must fit exactly together similar to that of a jigsaw puzzle. During construction, temporary structures are used to hold permanent structures in place. However slight deflection of these permanent structures can cause serious problems with structural integrity resulting in delays and budget overages. Engineers at Fehr-Graham precisely monitored deflection and deformation of the Savanna-Sabula bridge during construction of a replacement bridge adjacent to the current alignment using sensemetrics platform. This ensured that existing bridge maintained structural integrity and was operating safely during the construction process. Having real-time data is critical in this application because the Savanna-Sabula bridge was still operational, thus even minor deflections or deformations need to be immediately addressed. Additionally, sensemetrics software aggregated data from two (2) Leica Geosystems Automated Motorized Total Stations (AMTS) and calculated deltas from pre-calculated station coordinates, in real time. This allowed construction crews to precisely place structural member placement per engineer’s specifications – and subsequently verify that placement doesn’t deviate. This optimized approach to structural placement is consistent with Fehr Graham’s mission to optimize construction through efficient use of technology thus staying on schedule and on budget.